The dead have power to create controversy in the world of the living. One example involves a 9,500 year-old skeleton, one of the best-preserved early human fossils found in North America, whose discovery triggered a bitter debate over who owns America's past. 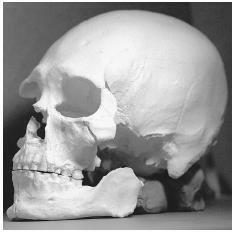 This plastic cast is of the 9,500 year-old skull found to be distinct from that of American Indians. Scientists believe that the man was long-limbed, middle-aged, approximately 5 feet 8 inches tall and weighed around 160 pounds . than 9,000 years, raise the possibility that more than one wave of early immigrants peopled America, and that American Indians were not the western hemisphere's first inhabitants. The skeleton quickly became the center of a political battle pitting conservative Indian tribes and the Native American Identity Movement against the interests of science and the human community at large. Upon announcement of the discovery, leaders of five Pacific Northwest Indian tribes claimed the bones under the Native American Graves Protection and Repatriation Act of 1990 (NAGPRA). The U.S. government, which owned the skeletal remains, agreed to turn them over to the tribes, rebuffing a request by scientists for the opportunity to study this rare find. Eight prominent anthropologists sued to stop reburial, bringing the first test case of the NAGPRA. The case ignited a conflict between religion, the political position of Native American activists, and the public's right to scientific knowledge about the ancient history of its homeland. On the religious front, the tribes believe that ancestors' remains must be returned to the earth lest their spirits be offended and wreak havoc among the living. Because the tribes' present-day religion holds that they were created near where the skeleton was found, they insist that Kennewick Man must be their ancestor. To deny their religious claims, they say, is to disrespect and weaken their culture. However, the religious claim is the less important one from the perspective of the Native American Identity Movement, which has as its goal the assertion of tribal rights to land and resources. In the 1970s this movement selected American Indian skeletons kept in museums as an issue of debate, maintaining that placing their skeletons in museum displays compromised their human rights. Kennewick Man and the few other early skeletons are particularly important because they suggest the chilling possibility that Indian people were not the first to occupy the Americas. If the U.S. government acquiesces to the tribes' claim to these most ancient remains, however, it affirms the movement's claim that Indian people were the first occupants of the American continent and supports the tribes' original right to land and resources. The movement is concerned that proof of an earlier people preceding them will weaken its claims. For the scientific community, the skeleton is a story about the life and death of an ancient American and a window into the history of the human species. Are the most ancient human fossils and artifacts the property of a few or should they be considered the heritage of all peoples? The answer, scientists feel, has global implications for their quest to understand the history of the human species. Chatters, James C. Ancient Encounters: Kennewick Man and the First Americans. New York: Simon & Schuster, 2001. Chatters, James C. "The Recovery and First Analysis of an Early Holocene Human Skeleton from Kennewick Washington." American Antiquity 65, no. 2 (2000):291–316. Thomas, David H. Skull Wars. New York: Basic Books, 2000. Preston, Douglas. "The Lost Man." The New Yorker, 19 June 1997, 70–81.